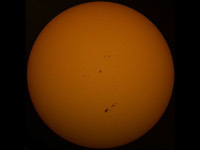 The best solar images taken by members of OASI are shown below. Martin Cook, 11 November 2018. 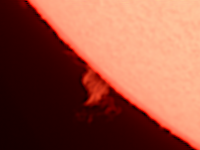 A large solar prominence in Hα light, taken at 11:45 UT. 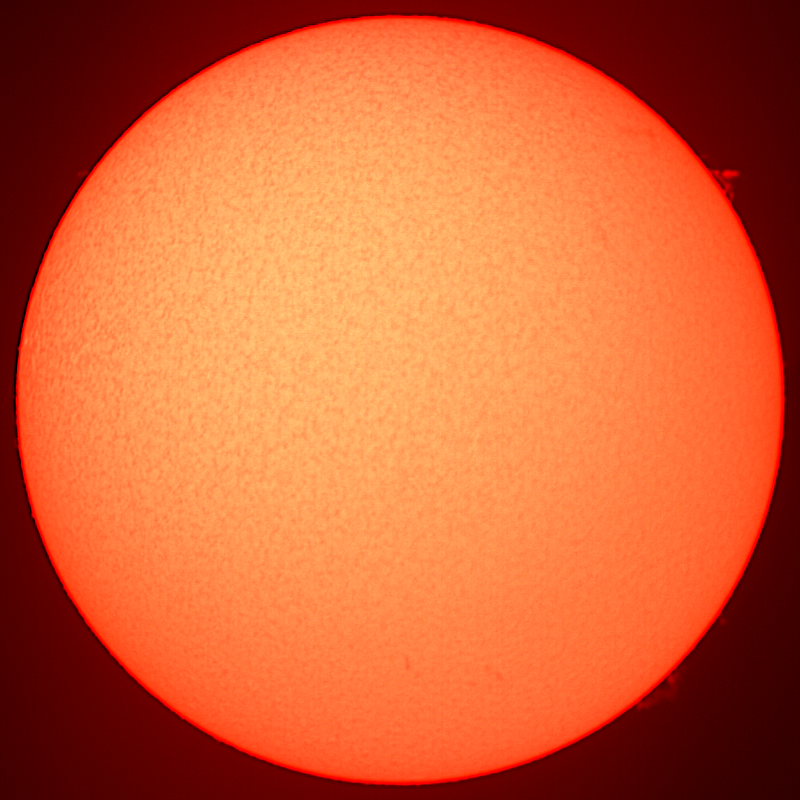 Lunt LS50THa B600PT H-alpha solar telescope with 2x Barlow lens and QHY5P-II colour camera. Martin Cook, 29 September 2018. 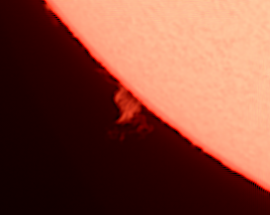 A large solar prominence in Hα light, taken at 10:30 UT. 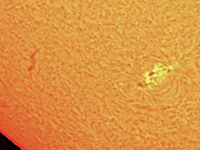 Lunt LS50THa B600PT H-alpha solar telescope with 2x Barlow lens and QHY5P-II colour camera. Martin Cook, 05 August 2018. 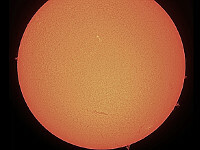 A large solar flare in Hα light, taken at 12:00:04 UT. Lunt LS50THa B600PT H-alpha solar telescope with 2x Barlow lens and QHY5L-II colour camera. 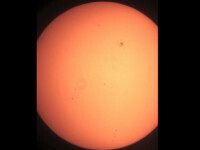 No sunspots were visible. Martin Cook, 08 July 2018. 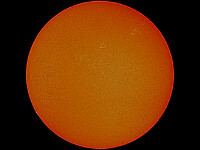 Image of the Sun in Hα light, taken at 09:30 UT. Lunt LS50THa B600PT H-alpha solar telescope and QHY5L-II colour camera. 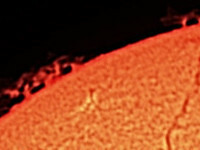 Note the large flares at the two o'clock and five o'clock positions. Martin Cook, 07 May 2018. Images of the Sun in Hα light, taken at 13:00 UT. 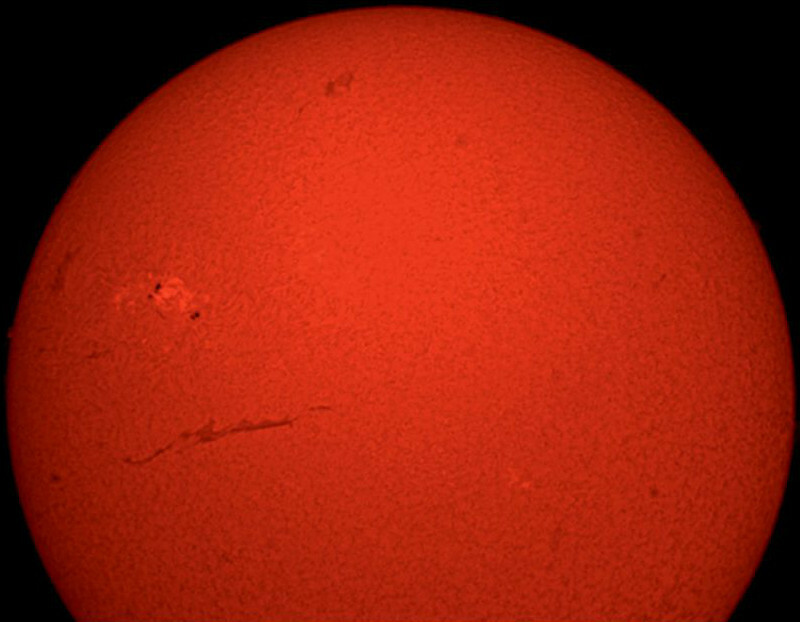 Lunt LS50THa B600PT H-alpha solar telescope and QHY5L-II colour camera. 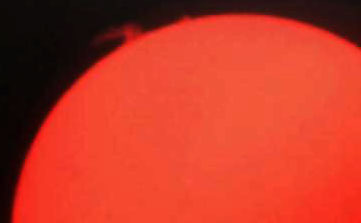 There is a flare at the one o'clock position (shown with close-up). Martin Cook, 22 April 2018. 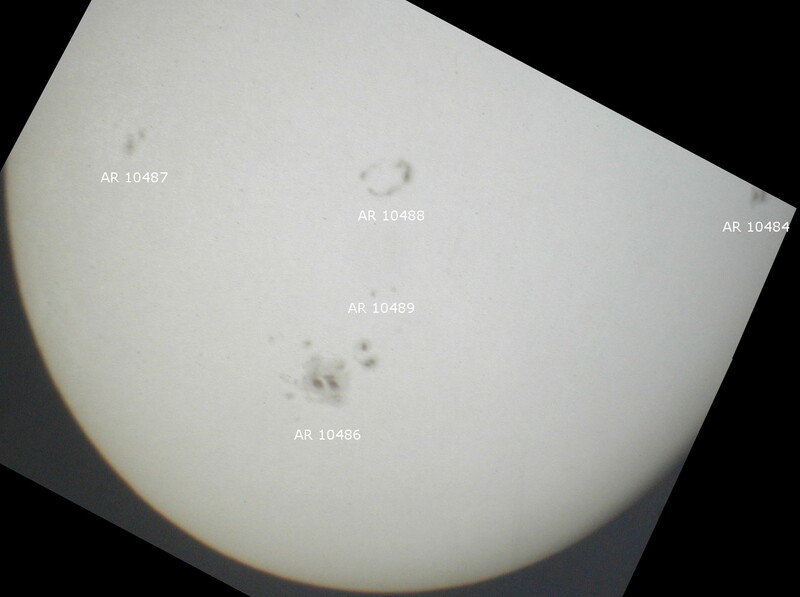 Images of the Sun in Hα light, taken at 13:09 UT. 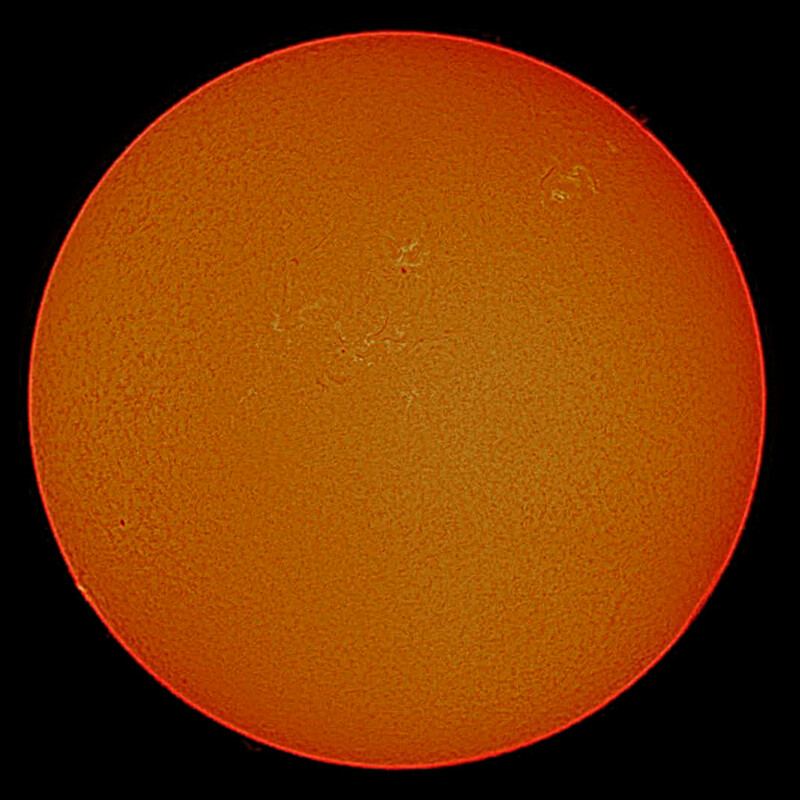 Lunt LS50THa B600PT H-alpha solar telescope and QHY5L-II colour camera. There is a large flare at the 12 o'clock position (shown with close-up) and a smaller one at 10 o’clock. 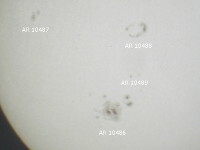 At seven o’clock is sunspot group AR 2706. Andy Gibbs, 19 April 2018. 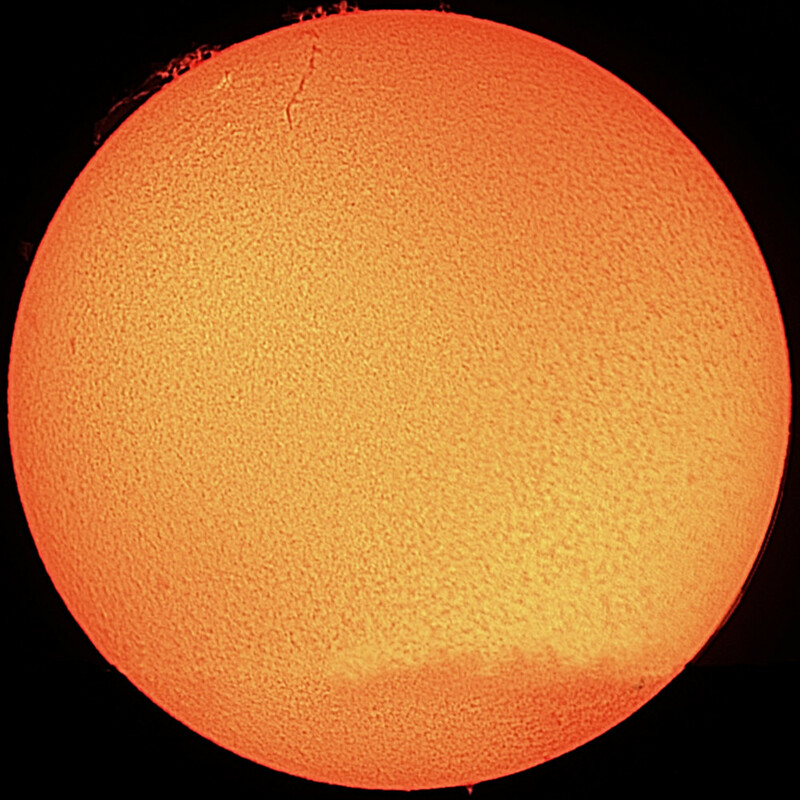 The disc of the Sun is featureless, but a few small prominences are visible around the lower edge (with close-up at top left). Coronado PST and QHY5L-II camera on Skywatcher Star Adventurer mount. David Murton, 20 August 2017. Montage of images of the Sun in Hα light, taken 08:31-08:52 UT. Coronada PST with Altair GPCAMv2 IMX224 camera. 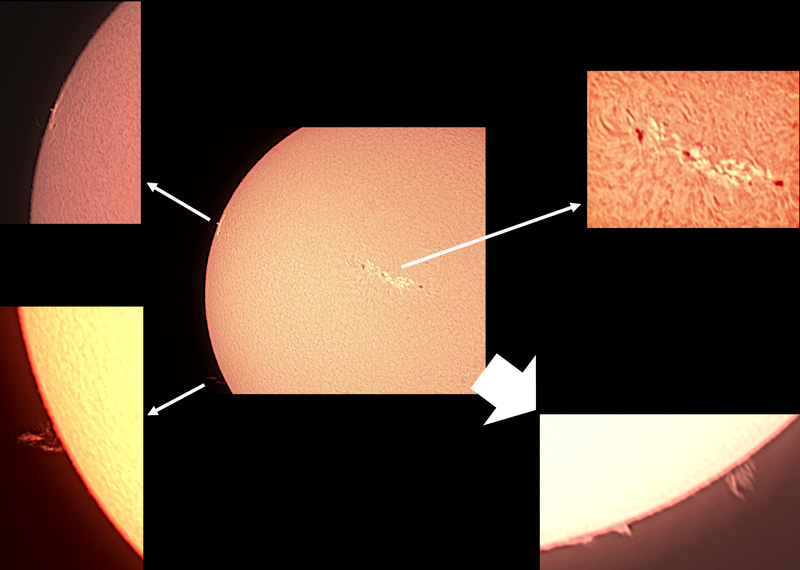 Shows granulation, spicules, prominences, sunspots and plages. Andy Gibbs, 13 July 2017. 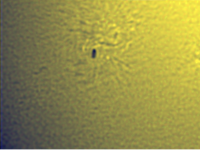 Large sunspot AR2665. 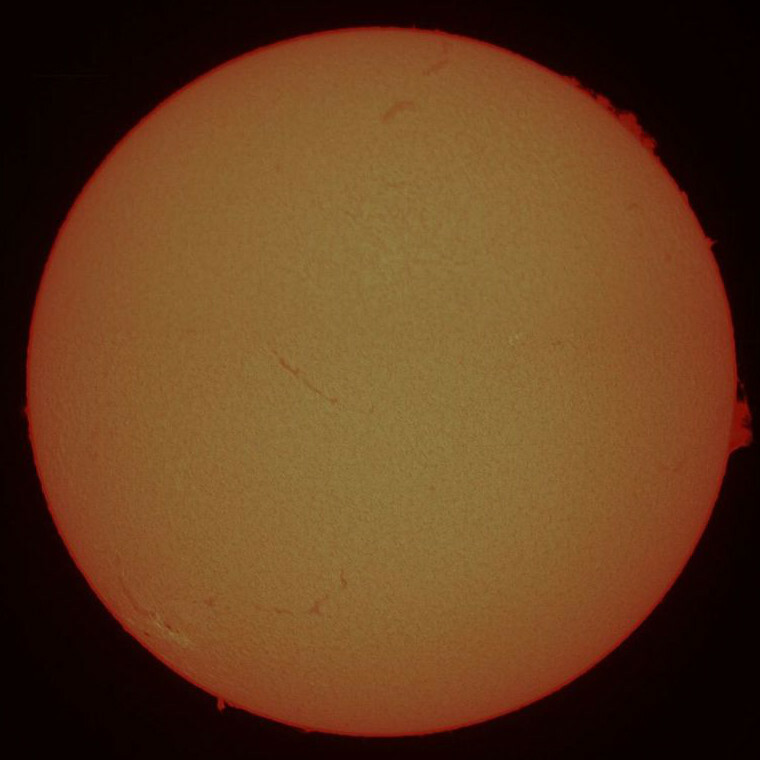 The disturbance had started to decay but, a day later, unleashed a CME (coronal mass ejection) which was predicted to hit the Earth on 16-17 July. 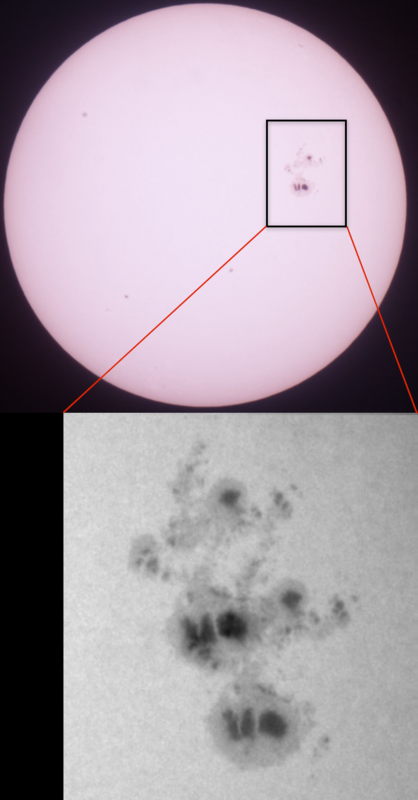 Coronado PST and QHY5L-II camera on Skywatcher Star Adventurer mount. David Murton, 04 June 2017. 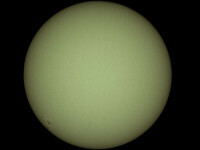 The Sun in Hα light, taken at 09:12 UT. Coronada PST with Altair GPCAMv2 IMX224 camera. Composite of individual images stitched together. David Murton, 04 June 2017. The Sun in Hα light, taken at 09:08 UT. Coronada PST with Altair GPCAMv2 IMX224 camera. Composite of individual images stitched together. David Murton, 26 May 2017. The Sun in Hα light, taken just before midday, UT. Coronado PST with Altair GPCAMv2 IMX224 camera and 2x Barlow lens. Andy Gibbs, 24 March 2017. The Sun in white light. 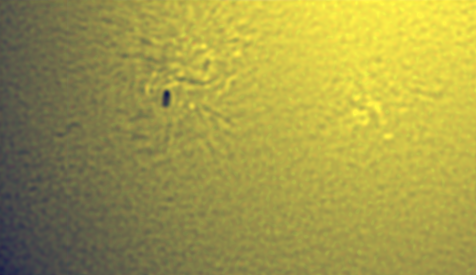 Meade 200 mm LX200 SCT. Kendrick white light filter. QHY5L-II camera. 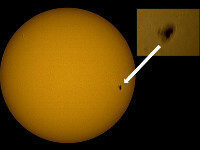 Just one sunspot (AR 2643) was visible; it had appeared after 15 spotless days at the beginning of the month. David Murton, 03 September 2016. The Sun in white light. 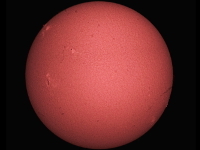 William Optics ZS71 ED 71 mm, f/5.9 refractor on NEQ6 mount. Orion white light filter. Altair GPCAM v2 IMX224 camera. David Murton, 03 September 2016. 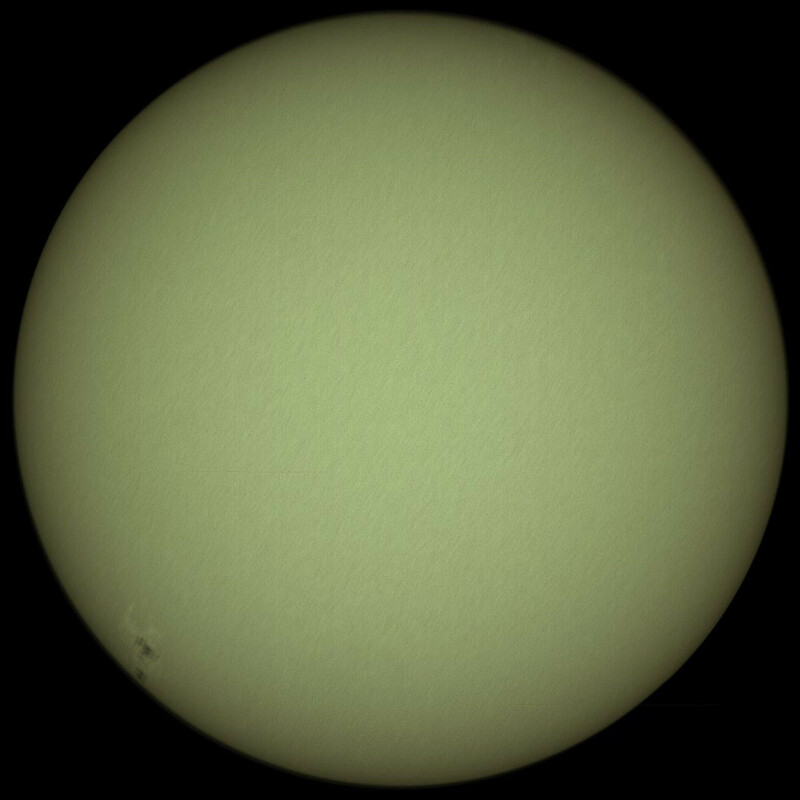 The Sun in Hα. Image taken 10 minutes before the preceding one. Coronado PST with Altair GPCAM v2 IMX224 camera. David Murton, 30 August 2016. The Sun in Hα. Coronado PST with Altair GPCAM v2 IMX224 camera. David Murton, 02 July 2016. The Sun in Hα. Coronado PST with Altair GPCAM v2 IMX224 camera. 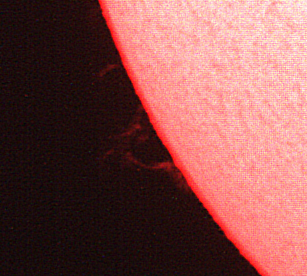 Many filaments are visible but no spots or prominences. David Murton, 25 June 2016. 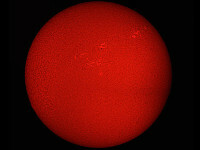 The Sun in Hα. Coronado PST with Altair GPCAM v2 IMX224 camera. David Murton, 01 May 2016. The Sun in white light. William Optics ZS71 ED 71 mm, f/5.9 refractor on NEQ6 mount. Orion white light filter. Altair GPCAM camera. David Murton, 01 May 2016. The Sun in Hα. Coronado PST and Altair GPCAM v2 IMX224 camera. David Murton, 01 May 2016. Details as previous image. David Murton, 17 April 2016. 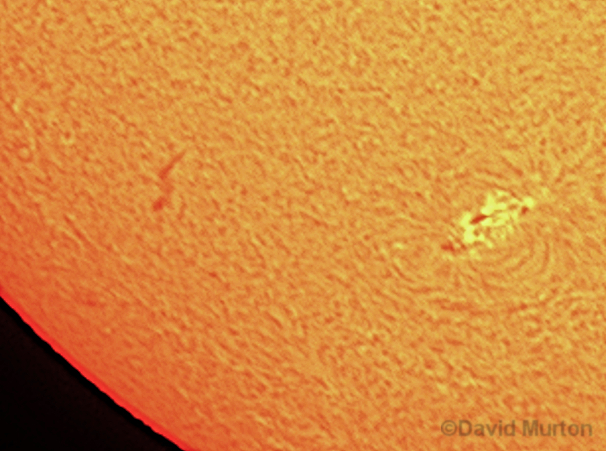 The Sun in white light with a huge sunspot about to disappear over the western limb while a smaller one has recently appeared at the eastern limb. 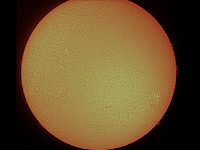 William Optics ZS71 ED 71 mm, f/5.9 refractor on NEQ6 mount. Orion white light filter. Altair GPCAM camera. 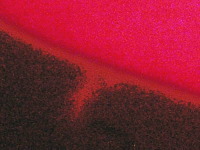 Close up using 4x Powermate. David Murton, 29 March 2016. A quiescent Sun. 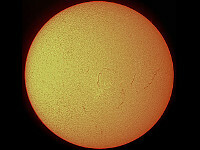 William Optics ZS71 ED 71 mm, f/5.9 refractor on NEQ6 mount. Altair GPCAM camera. 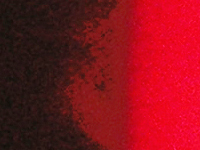 Close up using 4x Powermate. David Murton, 27 September 2015. 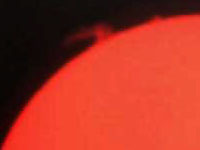 The Sun in Hα. 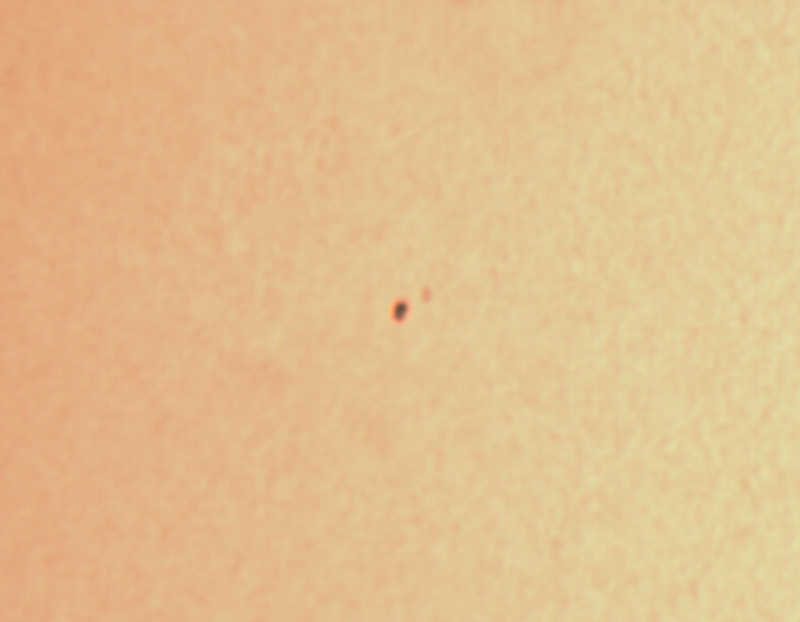 Coronado PST and QHY5L-II planetary camera. Kev Fulcher, 26 September 2015. Skywatcher 200P on HEQ5 mount, R/A driven. White light filter. Canon 70D camera. David Murton, 27 June 2015. The Sun in Hα. 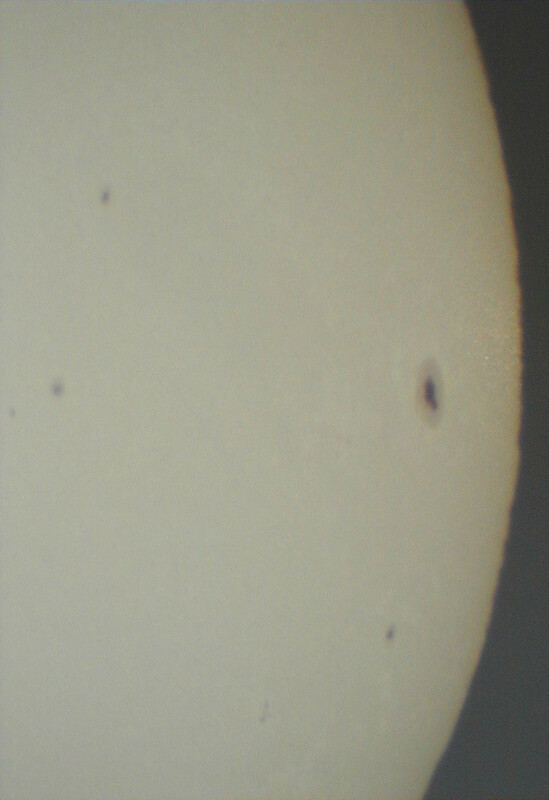 Coronado PST and QHY5L-II planetary camera. Martin Richmond-Hardy, 14 April 2015. Sunspots in white light. 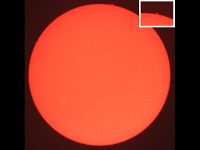 Skywatcher 200PDS Dobsonian, white-light Baader solar filter, 2x Barlow, Canon EOS 500D. David Murton, 23 March 2015. The Sun in Hα. 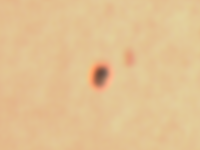 Coronado PST and QHY5L-II planetary camera. Martin Richmond-Hardy, 25 October 2014. The Sun with close-up of active region AR2192. White light. 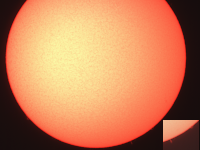 Skywatcher 200PDS Dobsonian, Baader solar filter, 2x Barlow for close-up, Canon EOS 500D. Martin Richmond-Hardy, 23 August 2014. 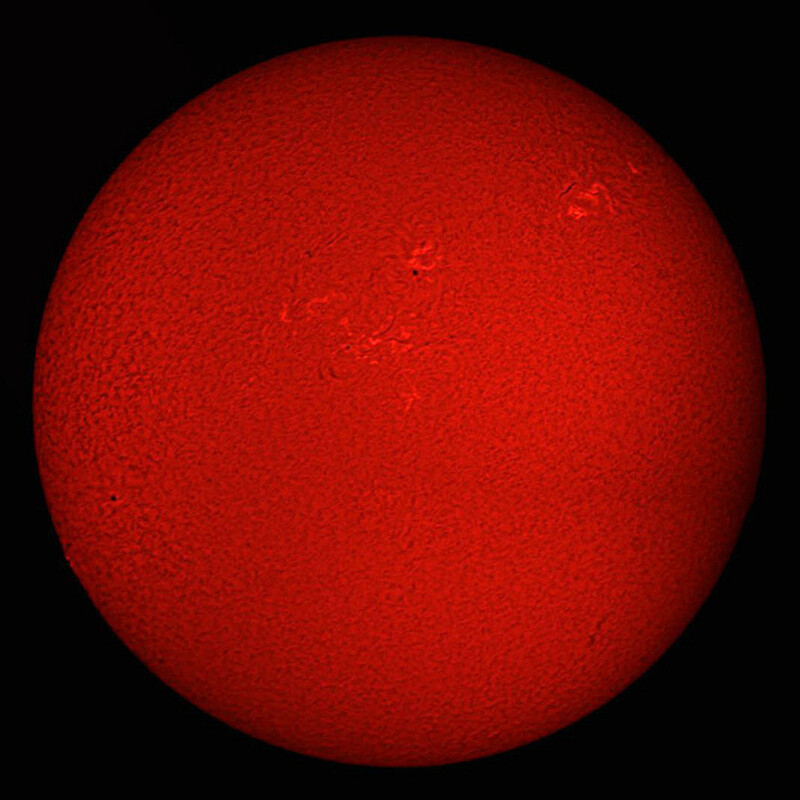 The Sun in white light. Skywatcher 200PDS Dobsonian, Baader solar filter, Canon EOS 500D. Martin Richmond-Hardy, 07 July 2014. 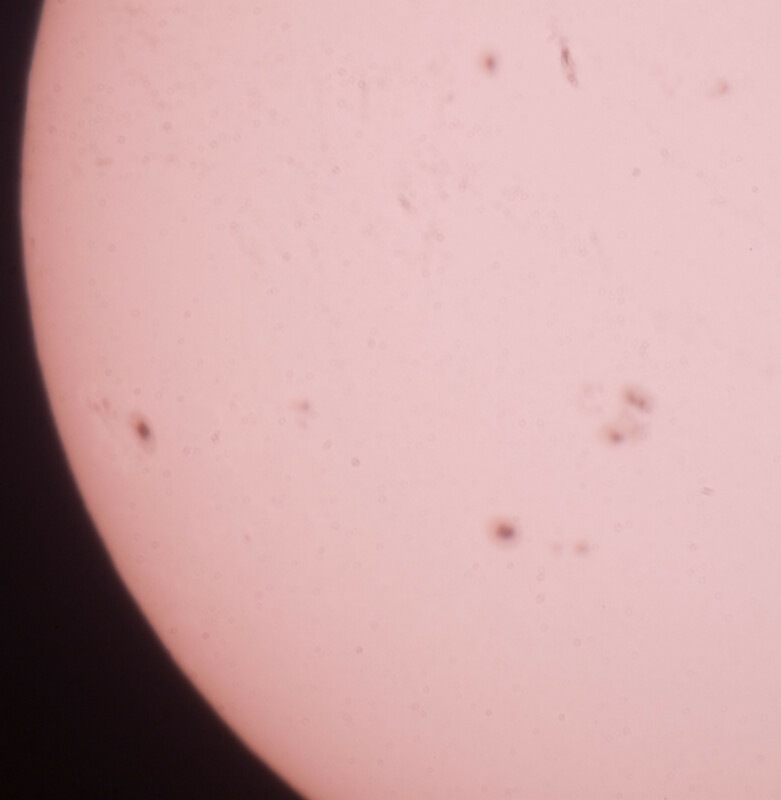 Sunspots in white light. 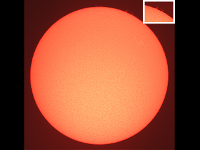 Skywatcher 200PDS Dobsonian, 2x Barlow, Baader solar filter, Canon EOS 500D. Martin Richmond-Hardy, 03 July 2014. 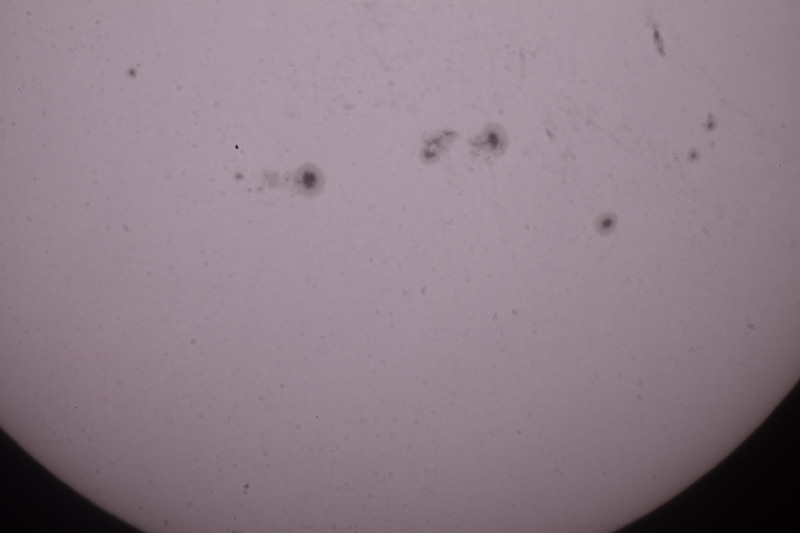 Sunspots in white light. 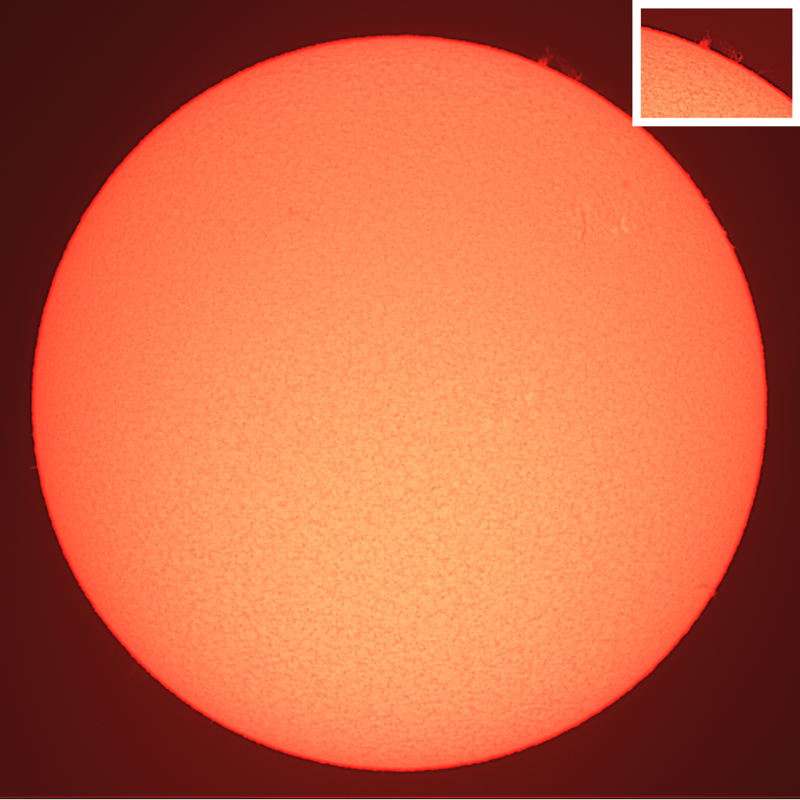 Skywatcher 200PDS Dobsonian, 2x Barlow, Baader solar filter, Canon EOS 500D. Mike Harlow, 05 January 2014. 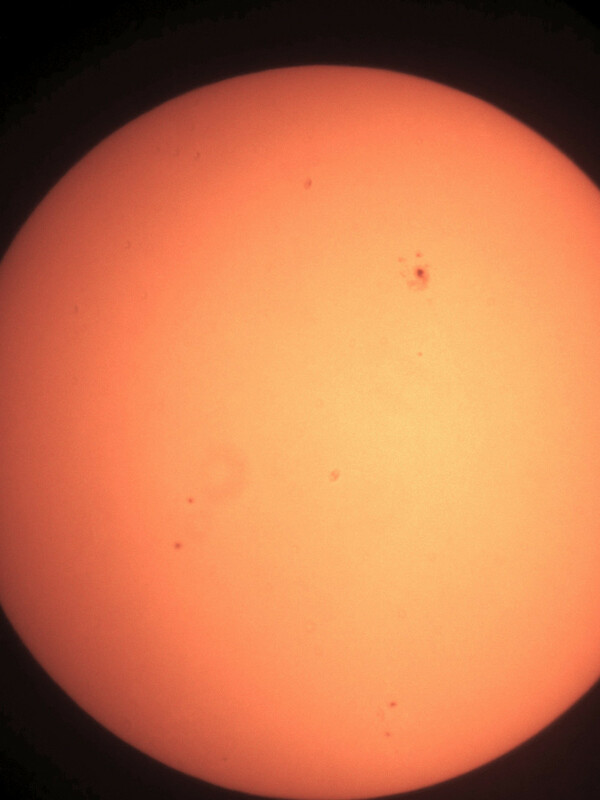 The Sun in white light, with active region AR1944 (visible to the naked eye with a solar filter). 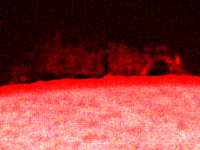 The image was taken shortly after sunrise, with the Sun at very low altitude, so suffers from atmospheric distortion. Canon 550D with 500 mm Tamron lens. Jeremy Hennell James, 29 July 2013. 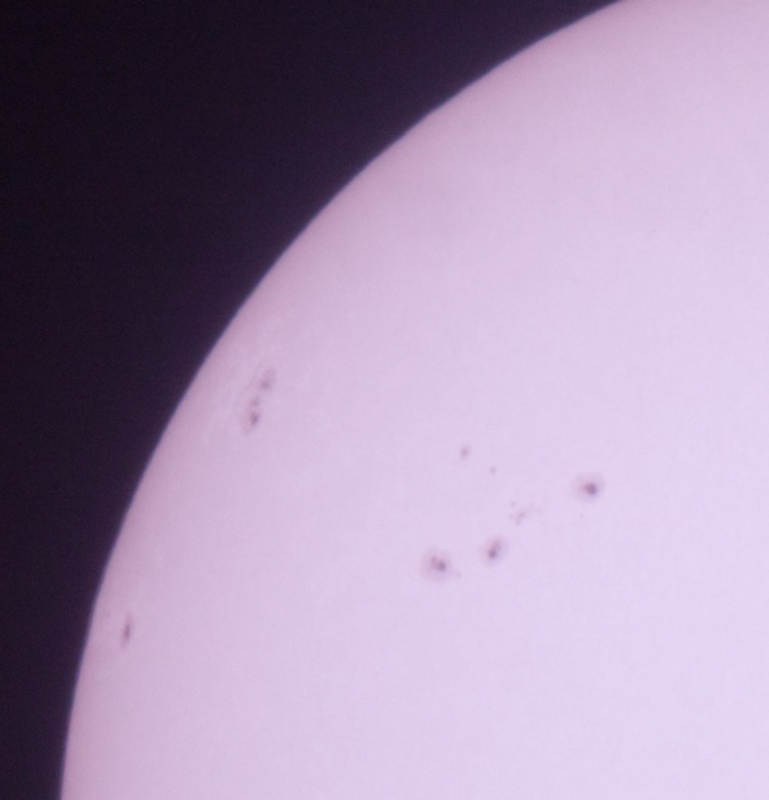 Sunspots and faculae in white light. 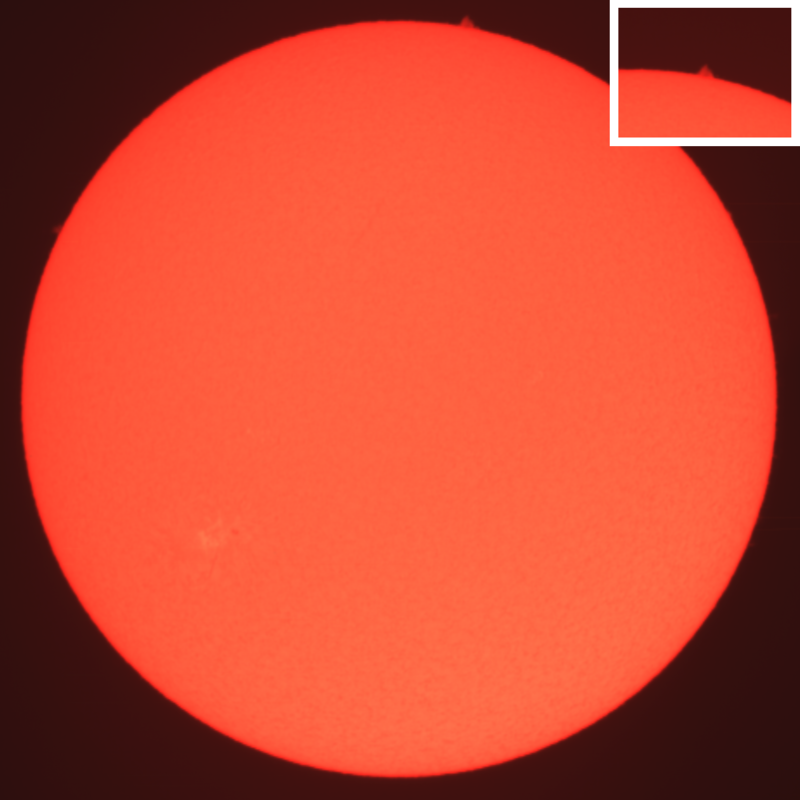 Skywatcher 150 mm reflector with AstroZap Baader solar filter, Canon 5D MkIII. Andy Gibbs, 25 July 2012. 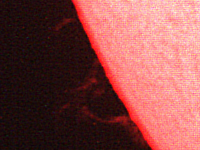 Large prominence in Hα. 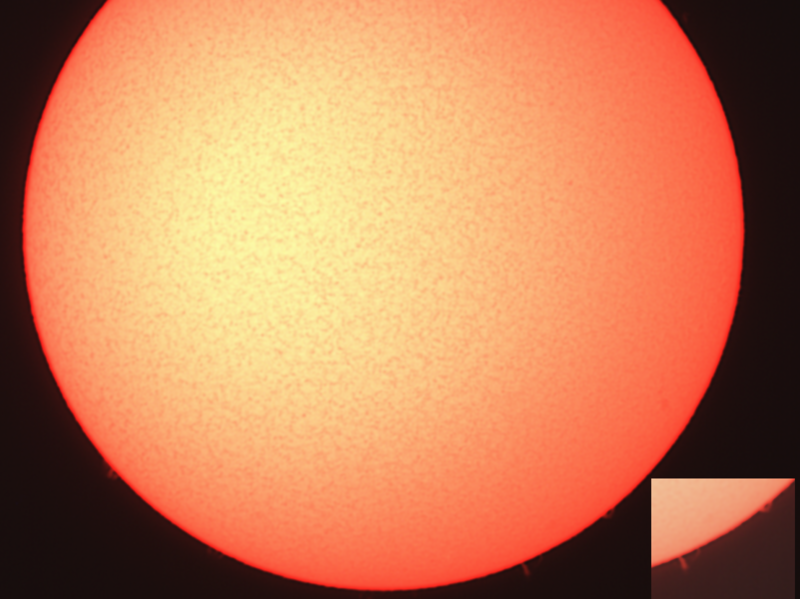 Coronado PST and Meade LPI. Mike Harlow, 12 July 2012. 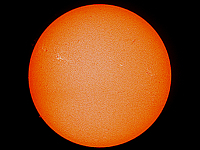 The Sun in white light, with active region AR1520 (visible to the naked eye with a solar filter). 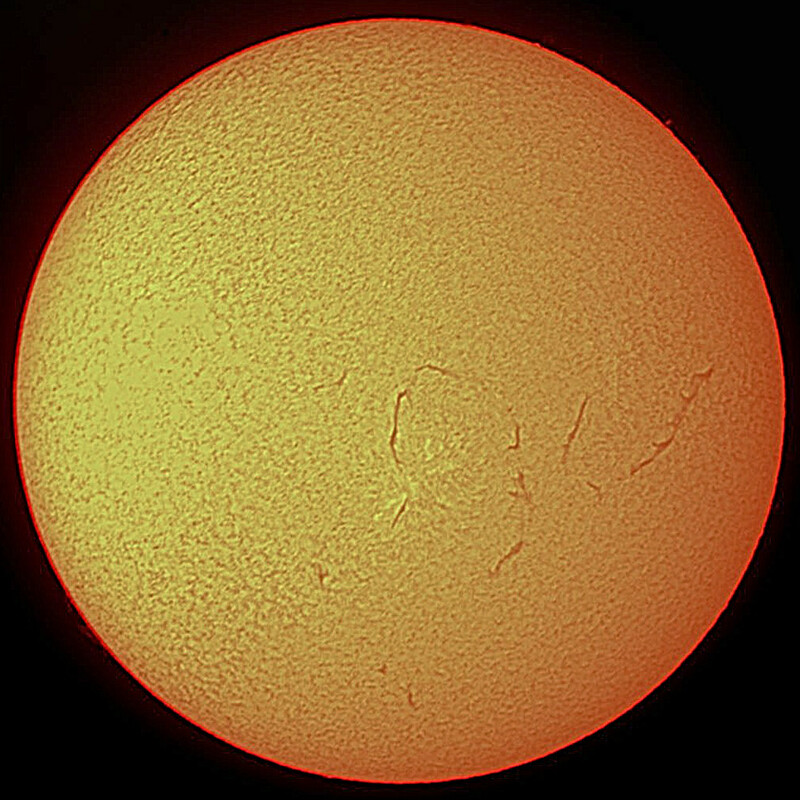 Canon 550D with 500 mm lens and ND5 solar filter. Mike Norris, 13 May 2012. 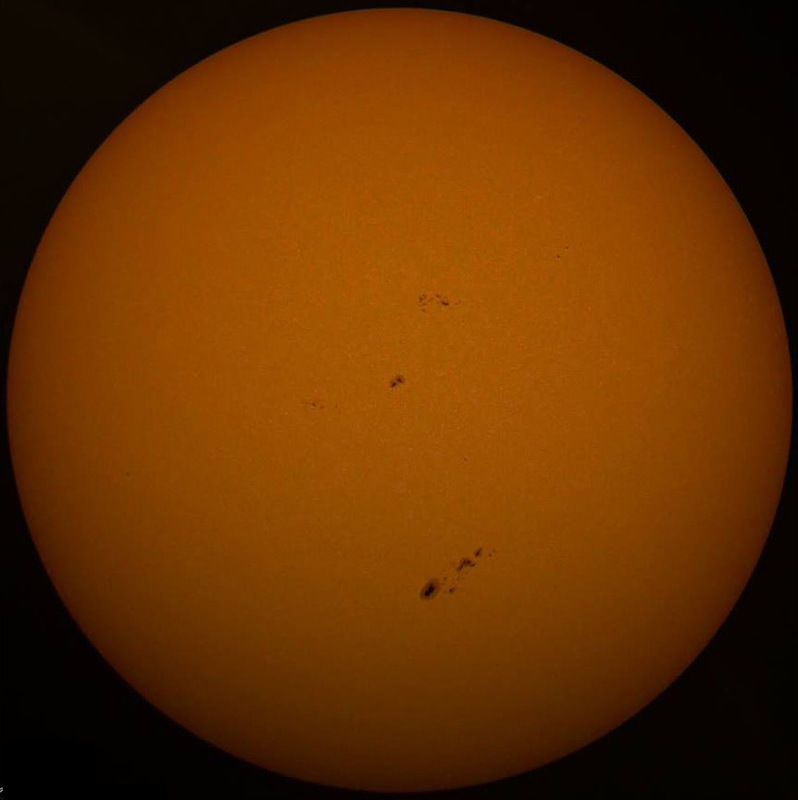 The Sun in white light with sunspot group AR1476. 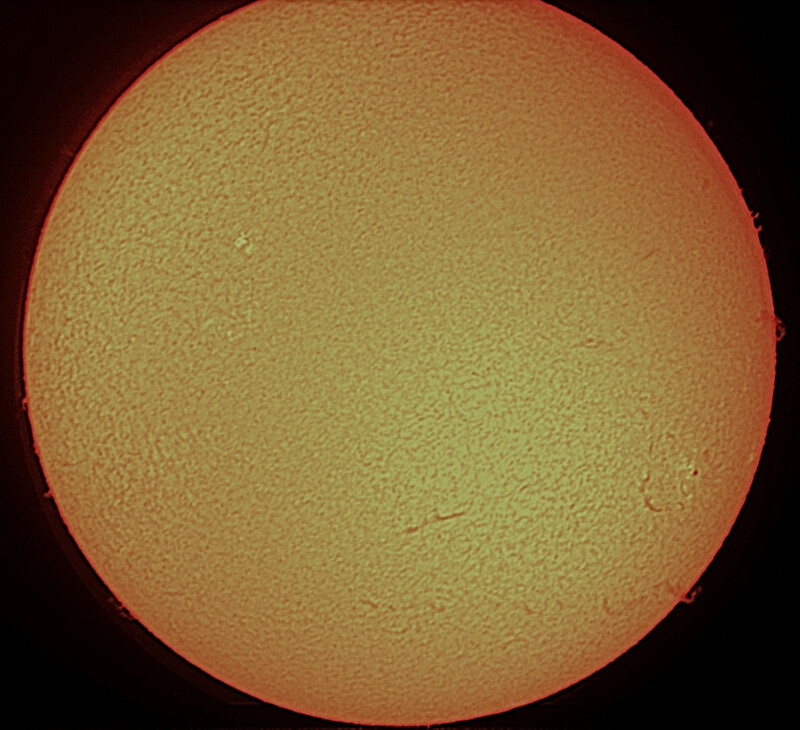 Celestron C90 spotting scope with Baader AstroSolar Film and Meade 26 mm eyepiece (48x magnification). Hand-held Lumix compact camera. Mike Harlow, 08 May 2012. 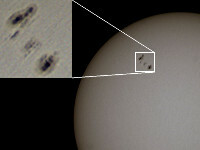 Large sunspot group in white light. 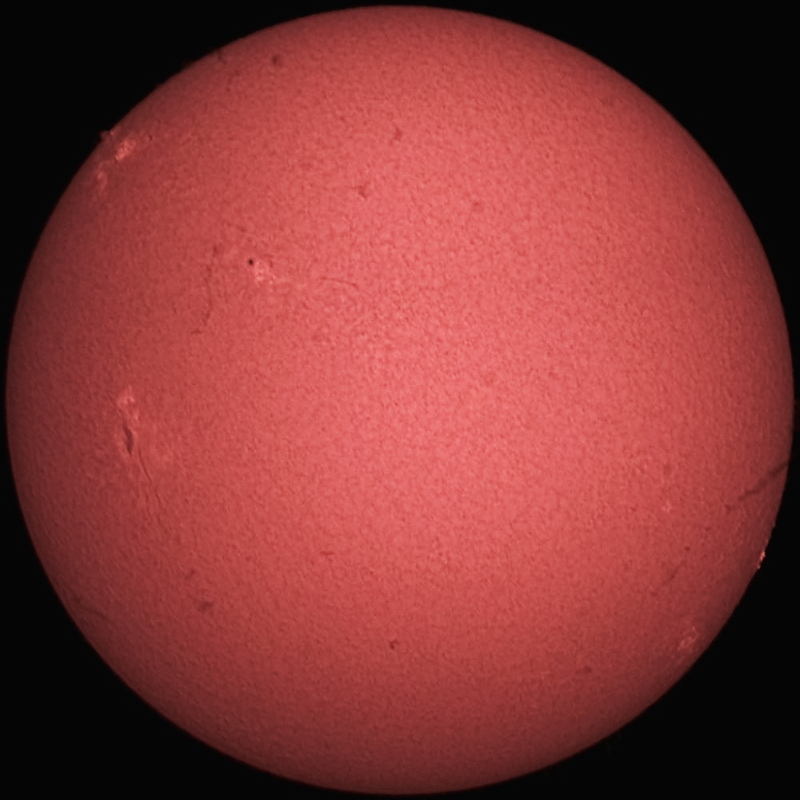 Canon 550D with 500 mm lens and ND5 solar filter. Mike Harlow, 07 May 2012. Equipment as previous image. Martin Cook, 02 June 2010. 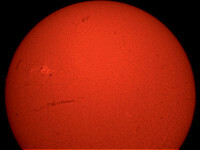 Solar flare in Hα. 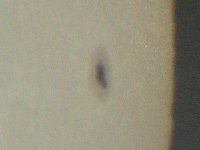 Coronado PST and Olympus C765 camera using eyepiece projection. Martin Cook, 24 May 2010. 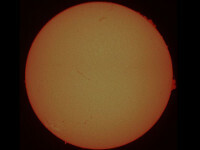 Solar flare in Hα. 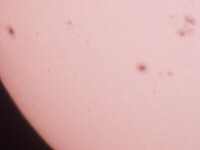 Coronado PST and Olympus C765 camera using eyepiece projection. Martin Cook, 27 October 2003. 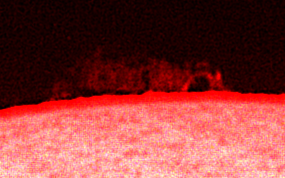 White light image of solar active regions AR10484-9. Active regions AR10484 and AR10486 are among the largest ever recorded: AR10484 grew to approximately the size of the planet Jupiter! 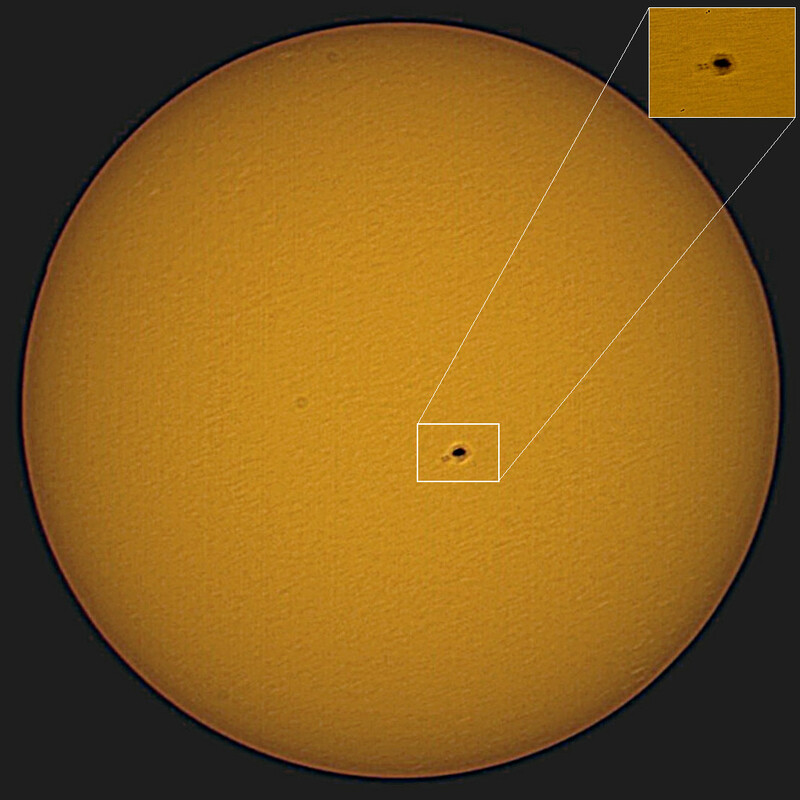 On 04 November 2003, AR10486 emitted a gigantic solar flare which, fortunately, was not aimed directly at Earth and therefore did not disrupt communications. 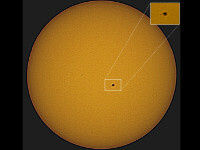 Photograph of solar projection using 250 mm Dobsonian. Martin Cook, 28 May 2001. 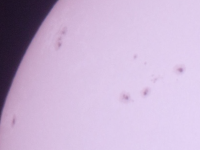 White light image of sunspots in active region AR9463 (soon to disappear over the western limb). 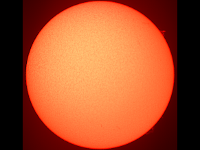 Photograph of image projected onto white card using the Tomline Refractor at Orwell Park Observatory. Roy Adams, 26 April 1984. 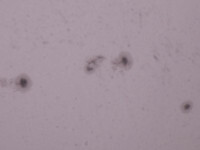 White light image of sunspot group circa 280,000 km in diameter. Roy Adams, 30 January 1984. 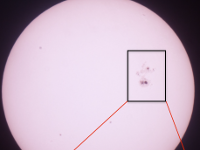 White light image of sunspot group about to disappear over the western limb. 48 mm object glass coupled to Zenith camera giving 140x magnification. 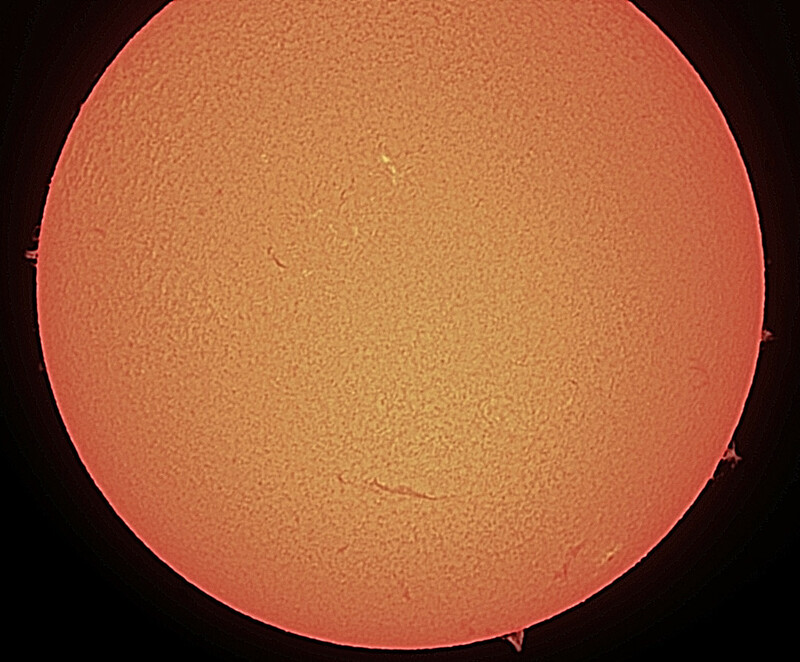 Solar filter. 8 ms exposure on 32 ASA film. Roy Adams, 25 January 1984. 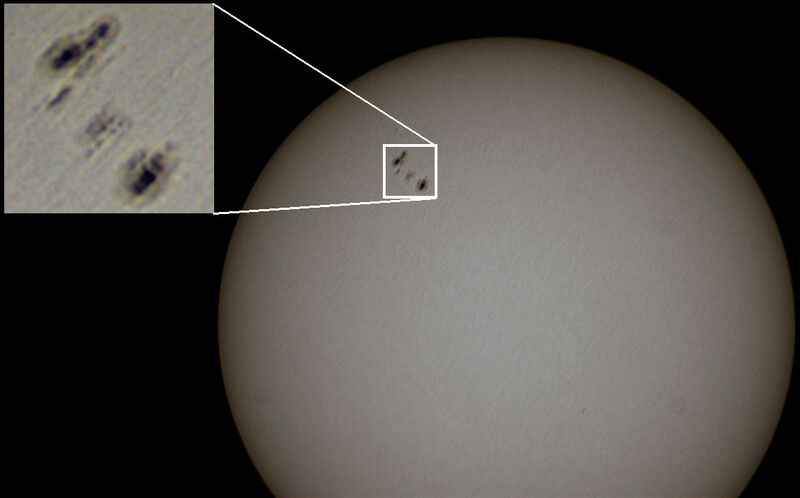 White light image of preceding sunspot group recently emerged over the eastern limb. 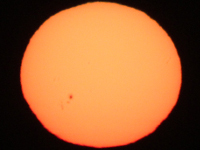 Telescope and camera as preceding image. 2 ms exposure.